2014 YEAR IN REVIEW: Perhaps the two biggest story lines of the 2014 season for the New York Giants were at the wide receiver position. First came the devastating knee injury to Victor Cruz in the game against the Philadelphia Eagles on October 5. Cruz was lost for the final 11 games of the season and it remains to be seen if he will ever return to his pre-injury form. The other major story line was the rapid emergence of Odell Beckham as an NFL superstar. Cruz and Beckham only played in two games together in 2014 before Cruz was lost for the season. Beckham had one of the greatest rookie seasons in NFL history, and he did so in only 12 games after missing most of training camp and all of the preseason. Indeed, Beckham became the only reason many Giants fans looked forward to tuning in in what otherwise was a very disappointing 6-10 season. Aside from these two headliners, while Rueben Randle came on strong late, he did not have the type of season expected or hoped for, and the former 2nd rounder remains frustratingly inconsistent. Jerrel Jernigan, who came on very strong at the end of the 2013 NFL season, reverted back to his old disappointing form and was placed on IR after only two games. Preston Parker not only surprisingly made the team but became the new #3 receiver after Cruz was lost. Corey Washington was a preseason star who was little-used once the real bullets started flying. Marcus Harris impressed in training camp but missed the season with a hip injury. 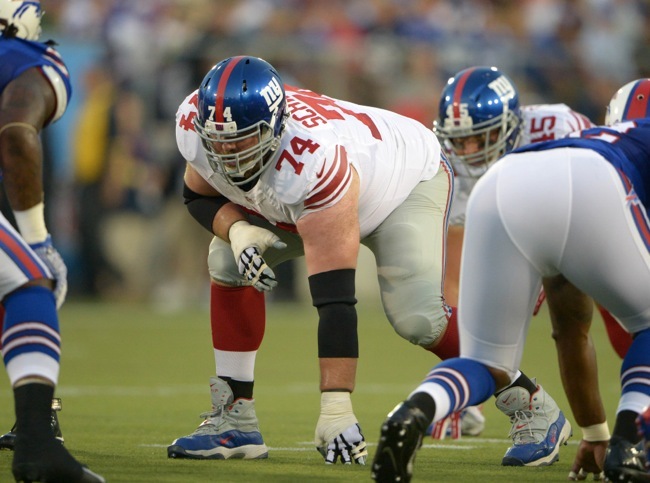 The Giants signed veteran Kevin Olgree in October, but he did not see much action. Julian Talley, Juron Criner, and Chris Harper were practice squad players. In the end, it was Beckham and not much else at the crucial wide receiver spot. Other teams knew that too and still could not stop Beckham. ADDITIONS/SUBTRACTIONS: The Giants released Kevin Ogletree in May after re-signing him in February and waived Marcus Harris in July. The team chose not to re-sign Jerrel Jernigan in free agency. The Giants signed Dwayne Harris from the Dallas Cowboys and drafted Geremy Davis in the 6th round of the 2015 NFL Draft. They also signed Ben Edwards, who was eligible to play in the NFL in 2014 after graduating from the University of Richmond, but sat out the year recovering from an ACL knee injury. TRAINING CAMP STORY LINES: The two main stories are obviously going to be Beckham and Cruz. 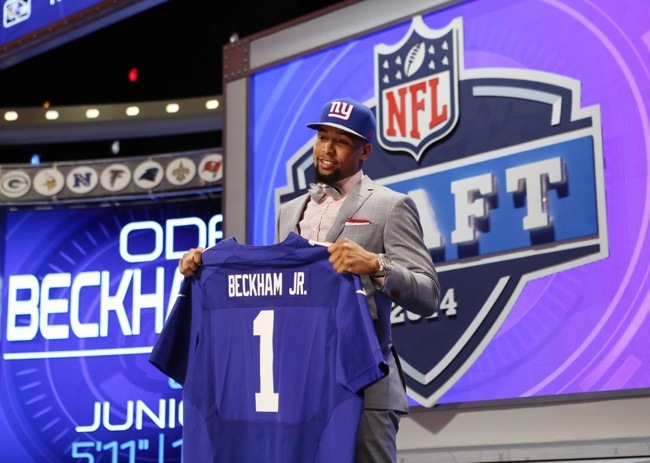 Can Beckham make the same impact or better in 2015 or will he regress? How will he handle the attention both on and off the field? How much of an impact will he make on the win-loss record? Beckham was once again nagged by a hamstring issue that caused him to miss most of the spring practices. The other main story is Cruz. The Giants have repeatedly said that they are optimistic about his return to form, but there are no guarantees that may never be the same player again. If he isn’t the same player, it will be a big hit to the team as Cruz was one of the few impact players on the Giants. Cruz may also not be long for the Giants given his high price tag. But if Cruz does return to form, he and Beckham and Randle could form possibly the best receiving corps in football and help carry the team to the playoffs. So much of the team’s success depends on Beckham and Cruz. It will be interesting to see how much work Cruz gets at training camp and in the preseason. He appears to have made tremendous progress in his rehabilitation. Randle also will also be under the spotlight. Although he had his best season to date in 2014, he was still inconsistent and was benched twice for disciplinary reasons. But he also exploded in the last two games, catching 12 passes for 290 yards and a touchdown. Plus it’s a contract year for Randle. If he plays like he did in the final two games, that will be a big asset for the Giants. 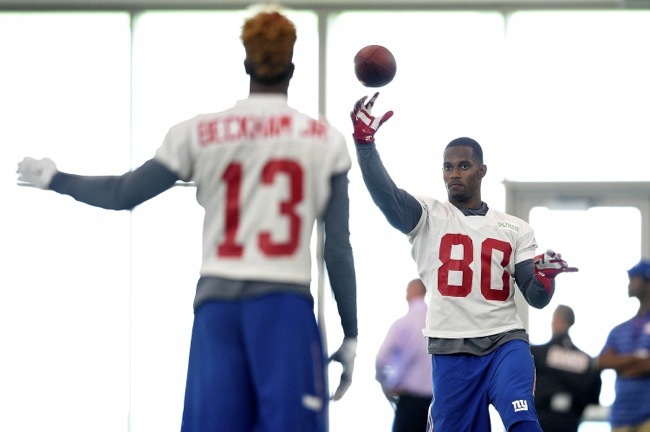 ON THE BUBBLE: The Giants will probably keep six wide receivers. Barring injury or unforeseen events, Beckham, Cruz, Randle, and special teams extraordinaire Dwayne Harris are the sure bets. That leaves two spots for Parker, Washington, Davis, Edwards, Criner, Talley, and Harper. 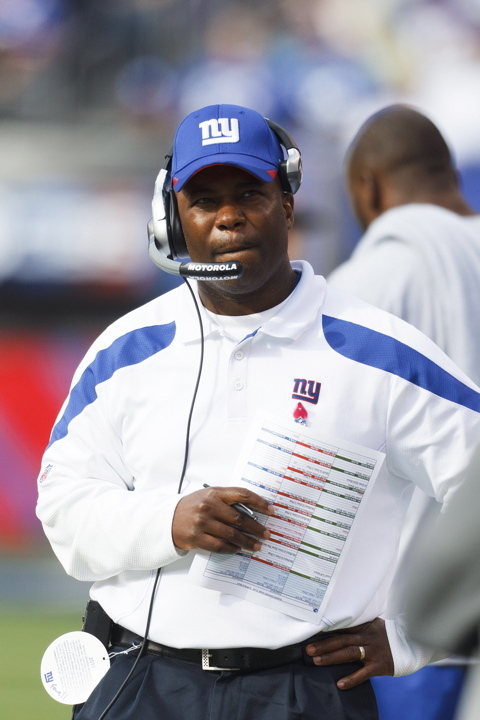 PREDICTIONS: Why have the Giants struggled so much since 2011? Because they haven’t had enough top NFL talent. Super Bowl-caliber teams need strong overall rosters but they also need impact players. It’s no accident that there has been a noticeable lack of NYG presence on “Top 100”, All-Star, and Pro Bowl lists. Two guys who can be impact players are Beckham and Cruz. And for the Giants to have any realistic shot at the Super Bowl, these two – along with Eli Manning – must carry the offense similar to what Manning, Cruz, and Hakeem Nicks did in the 2011 regular-season. Beckham seems “Lawrence Taylor”-like to me. If he can do for the offense what LT did for the defense in the 1980’s, this is going to be a fun. I just hope the limelight doesn’t go to his head because that and injury appear the only things that can derail him. As for Cruz, in a weird way, the injury may end up positively impacting his career. Since peaking in 2011-12, Cruz wasn’t playing up to the same level before the injury. The contract and limelight may have gotten to his head. Now Cruz will have to fight to prove the doubters wrong. He’s no longer the media darling. Beckham is. If his body doesn’t fail him, Cruz could rebound in a very big way. In the clutch, Eli trusts him. I think Cruz will be ready for opening night. The Giants are in a catch-22 situation with Randle. If he has a big year, it’s hard to see him wanting to re-sign with the Giants next offseason unless the team decides to part ways with Cruz. On the other hand, if he remains inconsistent, the team may not want to keep him. Regardless, it’s a big year for him financially, and because of that, I expect him to play well. My ultimate prediction is that this trio will combine with Eli Manning to get the team back into the playoffs in 2015. Beckham, Cruz, and Randle have a higher upside than Cruz, Nicks, and Mario Manningham. One final note. It seems as if the Giants may have an offensive role in mind for Harris too. They may move him around a bit like they do with Beckham to take advantage of his elusiveness with the ball in his hands after the catch. FINAL DEPTH CHART: Beckham, Cruz, Randle, Harris, Davis, and Washington. The tough call here is on Preston Parker. He could push Davis or Washington. 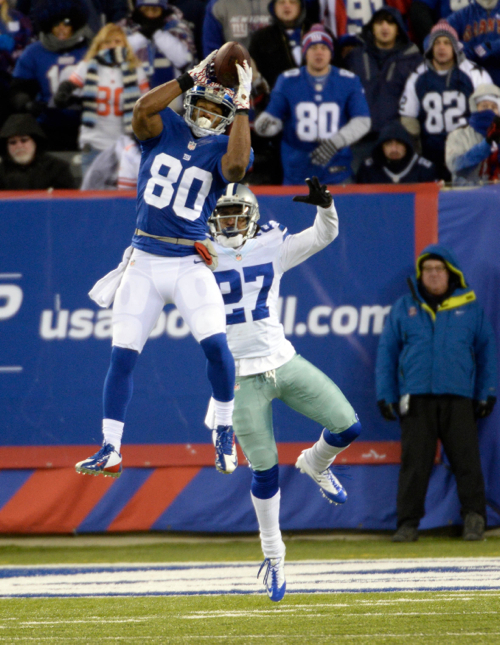 Perhaps the two biggest story lines of the 2014 season for the New York Giants were at the wide receiver position. First came the devastating knee injury to Victor Cruz in the game against the Philadelphia Eagles on October 5. Cruz was lost for the final 11 games of the season and it remains to be seen if he will ever return to his pre-injury form. The other major story line was the rapid emergence of Odell Beckham as an NFL superstar. The irony is that Cruz and Beckham only played one game together in 2014, and that was the game Cruz got injured. Beckham had one of the greatest rookie seasons in NFL history, and he did so in only 12 games, and playing with significant hamstring tears. Indeed, Beckham became the only reason many Giants fans looked forward to tuning in in what otherwise was a very disappointing 6-10 season. Right or wrong, his performance may also have saved Tom Coughlin’s job as one wonders what the Giants’ record would have been without him. Aside from these two headliners, while Rueben Randle came on strong late, he did not have the type of season expected or hoped for, and the former 2nd rounder remains frustratingly inconsistent. Jerrel Jernigan, who came on very strong at the end of the 2013 NFL season, reverted back to his old disappointing form and was placed on IR after only two games. Preston Parker not only surprisingly made the team but became the new #3 receiver after Cruz was lost. Corey Washington was a preseason star who was little-used once the real bullets started flying. Despite missing virtually all of training camp, the entire preseason, and the first four games of the regular season with hamstring tears, Odell Beckham, Jr. had one of the greatest rookie seasons in NFL history in 2014. Beckham finished the season with 91 catches for 1,305 yards and 12 touchdowns, all franchise rookie records. He also set a franchise record and NFL rookie record averaging 108.8 yards per game. Beckham set NFL records for most catches and yards in the first 12 games to start a career and tied an NFL record for with at least 90 receiving yards in nine consecutive games. He was voted first-alternate to the Pro Bowl and played in the game. He was also voted Pro Football Writers of America “Rookie of the Year.” Beckham was drafted in the 1st round of the 2014 NFL Draft by the Giants. While Beckham lacks classic size, his long arms, big hands, and jumping ability give him a very good catch radius. Beckham is a tremendous athlete with excellent speed, quickness, and agility. Explosive. For such a young player, he can already play multiple positions and runs good routes. Beckham is very quick out of his breaks, adjusts exceptionally well to the football, and regularly makes the circus catch. He is dangerous with the football in his hand after the catch. Competitive, smart, and hard working. Beckham also was a very dangerous return man in college. He averaged 8.1 yards per punt return with the Giants in 2014. 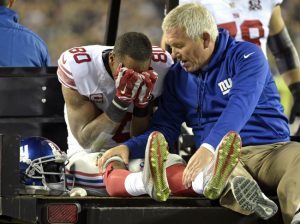 Victor Cruz was placed on Injured Reserve after tearing the patella tendon in his right knee in October 2014 and it remains to be seen if Cruz can completely regain his pre-injury physical ability. Cruz finished the 2014 season with 23 catches for 337 yards and one touchdown in six starts. Signed as a rookie free agent after the 2010 NFL Draft, the rags-to-riches Victor Cruz story is well known, culminating with his impact season in 2011, first Pro Bowl in 2012, and big offseason contract in 2013. In 2011-2012, he compiled 168 catches for 2,628 yards and 19 touchdowns. However, in 2013 Cruz had his least productive season since becoming a starter in 2011. He also missed the last two games of the 2013 season with concussion and knee injuries – the left knee requiring arthroscopic surgery. Cruz has ordinary size and timed speed. However, he has very good quickness and plays faster than he times. Cruz reads coverages well, runs good routes, and has a good understanding of how to get open against both zone and man coverage. Cruz has good hands and is capable of making the circus catch, though he sometimes will drop the easy reception. He is elusive after the catch and usually isn’t caught from behind. Cruz is a hard worker. He can play outside, but has really developed into one of the NFL’s better slot receivers. 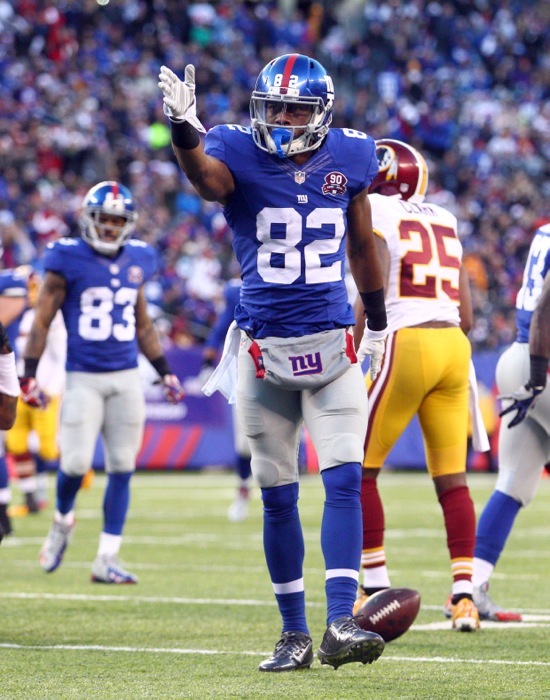 Rueben Randle, a 2nd round pick in the 2012 NFL Draft, remains an inconsistent performer. But he had his best season in 2014, catching 71 passes for 938 yards and three touchdowns. He played in all 16 games with 13 starts with his two best games coming at the end of the season. Randle was benched for the first quarter of two games for disciplinary reasons. Randle has a nice combination of size and athletic ability, and he has flashed play-making skills as a vertical receiver. While Randle is not a burner, he is fluid and smooth with good foot quickness and acceleration for a big receiver. He needs to improve his ability to read defenses and improve his route-running. Randle adjusts well to the football in the air and has good hands. Most of all, he needs to become a more consistently reliable performer so his quarterback can trust him. Randle can also return punts, averaging 7.8 yards per return in 2012-13. An afterthought by many when the Giants signed him to a reserve/future contract in January 2014, Preston Parker became the team’s primary slot receiver after Victor Cruz was lost for the season. Parker played in all 16 games with seven starts. He finished 2014 with 36 catches for 418 yards and two touchdowns. Parker was originally signed as an undrafted rookie free agent by the Tampa Bay Buccaneers after the 2010 NFL Draft. The Buccaneers waived him in September 2012. He was with the Saints in training camp in 2013 but he did not play that season. While Parker lacks ideal size and speed, he is a decent athlete with good quickness and hands. Parker needs to be a more consistent performer. He returned both punts (6.6 yard average) and kickoffs (24.2 yard average) for the Giants in 2014. The Giants signed Kevin Ogletree in October 2014. He played in seven games, but only caught five passes for 50 yards. Ogletree was originally signed as an undrafted rookie free agent by the Dallas Cowboys after the 2009 NFL Draft. He has spent time with the Cowboys (2009-12), Tampa Bay Buccaneers (2013), and Detroit Lions (2013-14). The Lions waived Olgetree in September. In six NFL season, Olgetree has played in 69 games with four starts. He has 83 career receptions for 1,049 yards and six touchdowns – two of which he scored against the Giants in the 2012 opener as a Cowboy. Ogletree has decent size, athletic ability, and hands. 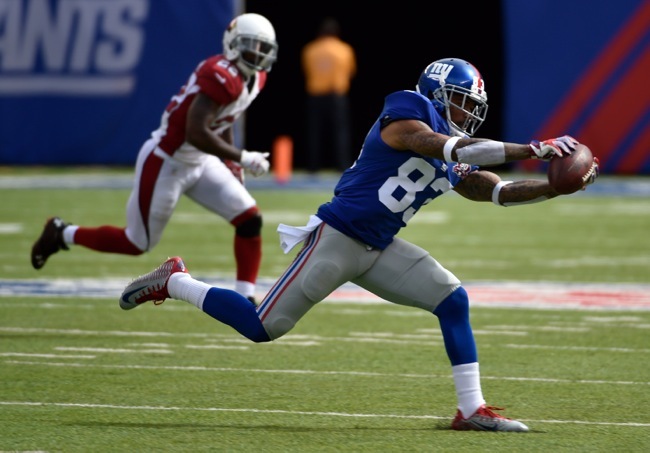 The Giants claimed Corey Washington off of waivers from the Arizona Cardinals in May 2014. He was a preseason standout for the Giants, catching 10 passes for 155 yards and four touchdowns. While he played in 14 games in 2014, he seldom saw the field and finished the year with five catches for 52 yards and a touchdown. Washington originally signed with the Cardinals as an undrafted rookie free agent after the 2014 NFL Draft. Washington played at Division-II Newberry College. Washington combines excellent size, overall athleticism, and speed. However, given his small-school background, he is very raw and needs a lot of development. Jerrel Jernigan was placed on Injured Reserve in September 2014 with a mid-foot sprain. He played in two games and finished the season with only one catch for six yards. Drafted in the 3rd round of the 2011 NFL Draft by the Giants, Jernigan had a coming out party late in the 2013 season. In his first two years with the Giants, Jernigan played in 17 games and had a grand total of three catches for 22 yards. Through Week 14 of 2013, Jernigan had “amassed” 10 catches for 92 yards. Then in Weeks 15-17, Jernigan exploded with 19 catches for 237 yards and two touchdowns in addition to carrying the ball twice for 57 yards and a touchdown. However, Jernigan did not really flash during the 2014 training camp or preseason. Jernigan lacks size, but he is a quick, fluid athlete with good speed. He is better suited to the slot position than outside. Jernigan also returns kickoffs, averaging 23.4 yards per return in his first three seasons on 21 returns. Marcus Harris was placed on Injured Reserve in August 2014 with a hip injury that required surgery on his labrum. Harris was originally signed as an undrafted rookie free agent by the Detroit Lions after the 2011 NFL Draft. He spent time on Detroit’s Practice Squad in 2011, but the Lions waived him in July 2012. The Titans signed him in August 2012 but waived him a few weeks later. Before the NFL season started in 2013, Harris played in the Arena League caught 94 passes for 1,223 yards and 19 touchdowns. The Giants signed Harris as a street free agent in August 2013 and he spent most of the season on the team’s Practice Squad. Harris has a decent size-speed combination. He flashed with the Giants during training camp and the preseason in 2014, even earning time with the first-team offense, before being played on Injured Reserve. 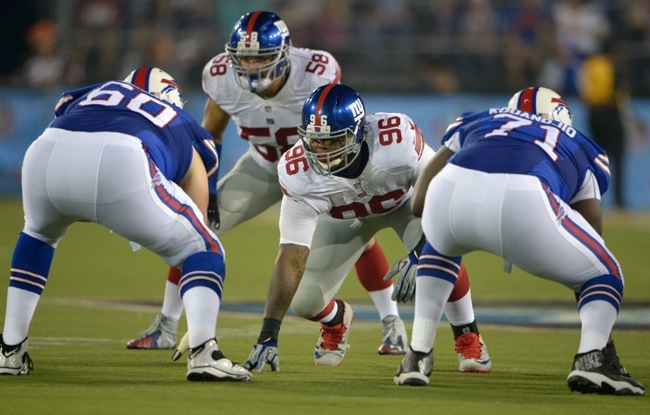 Julian Talley was originally signed as an undrafted rookie free agent by the Giants after the 2012 NFL Draft. He did not make the team, but the Giants brought him back for another go in 2013 and 2014. Talley spent most of the 2013 and 2014 seasons on the team’s Practice Squad, although he did play in two games each season. He does not yet have an NFL catch. Talley is a tall, thin receiver with good overall athletic ability. He lacks ideal speed, but is smooth and fluid with decent hands. 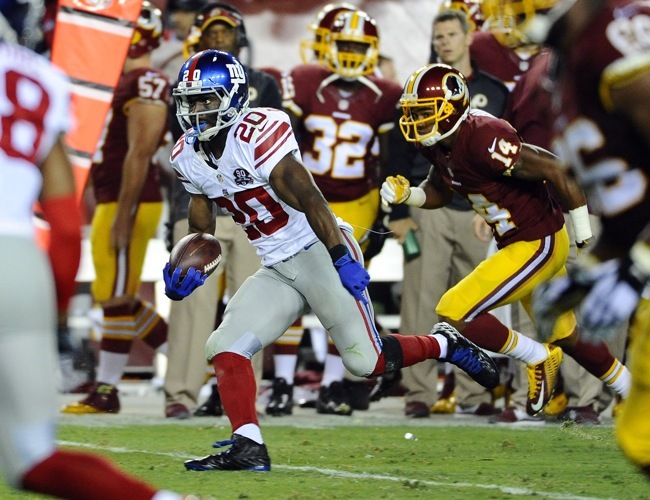 Juron Criner was signed to the Practice Squad in September 2014. Criner was originally drafted in the 5th round of the 2012 NFL Draft by the Oakland Raiders. The Raiders waived him on August 26. In 13 games with the Raiders, Criner has caught 19 passes for 183 yards and a touchdown. He is a big receiver with good overall athleticism, but he needs to develop better technique and consistency. Chris Harper was signed to the Practice Squad in October 2014. Harper was originally drafted by the Seattle Seahawks in the 4th round of the 2013 NFL Draft. Harper did not make the team but spent time with the 49ers (2013) and Packers (2013-14). Harper played in four games with the Packers in 2013 and was cut by the team in August. Harper has a nice combination of size and athletic ability. He is a tough, physical receiver with good speed and hands. November 4, 2014 New York Giants Injury Report: As feared, CB Prince Amukamara, who suffered a torn biceps muscle during the game on Monday night against the Indianapolis Colts, will miss the remainder of the 2014 NFL season. November 4, 2014 Tom Coughlin Press Conference: The transcript of Head Coach Tom Coughlin’s Tuesday’s conference call is available at BigBlueInteractive.com. October 17, 2014 New York Giants Injury Report: RB Rashad Jennings (knee) did not practice on Friday. Jennings has been ruled out of the game against the Dallas Cowboys on Sunday. CB Dominique Rodgers-Cromartie (back/hamstring) and LB Spencer Paysinger (hamstring) practiced on a limited basis. Both are officially “questionable” for the game. LB Jon Beason (toe) and P Steve Weatherford (left ankle) fully practiced. Both are “probable” for the game. Victor Cruz Vows to Return: WR Victor Cruz, who suffered a devastating season-ending and potentially career-threatening knee injury last Sunday against the Philadelphia Eagles, addressed the media on Friday for the first time since the injury. Cruz underwent surgery on Monday to repair the torn patella tendon in his right knee. “I will be back,” said Cruz. “I don’t have any doubt that my rehab process will be successful. I will be in tip-top shape and ready to go when the time is right. I don’t have any doubt in my mind, I have never been bred that way, I never just believed in doubt. I always believed in whatever I can put my mind to, whatever God has enabled me to do, or whatever He has planned for me is going to happen. I think that is what fuels me, I don’t have any doubt that I will come back from this injury in a positive way. “I’m excited about the rehab process and getting back to my old self, my normal self. The next couple days I just want to continue to go in there and get my rehab, continue to be a voice in the locker room with my peers, with my teammates and just continue to be a good teammate. Even though I’m not physically out on the field, I still want to be able to talk to those guys and make sure I continue to be a voice. I’m headed in the right direction. Cruz said that fellow teammates CB Zack Bowman and WR Marcus Harris had the same injury. “They just told me to be patient,” Cruz said. “It’s something that you can come back from, it’s something that if you strengthen it properly and you do the due diligence as far as the rehab is concerned, you can come back strong, you can come back faster and you won’t even think about it come a couple months down the road. You’ll be playing and not even thinking about anything below your kneecap. I’m excited for that and they just reassured me that this is something that I can come back from and it’s something that won’t hinder my abilities moving forward as well. “That is my goal (to be ready by training camp). Even before that, I want to be able to start training properly, start training my body properly for training camp, and I will think I will definitely be ready by then. I think I will be ready to do all of the good things to continue to be my old self come training camp next year. Cruz also revealed that he taped a video message for his teammates that will be played on Saturday night in the team’s hotel. Cruz said he plans to continue to help his teammates despite the injury. October 17, 2014 Tom Coughlin Press Conference: The video from Friday’s press conference with Head Coach Tom Coughlin is available at Giants.com. September 17, 2014 New York Giants Injury Report: Not practicing on Wednesday were WR Odell Beckham (hamstring), LB Jon Beason (foot/ankle), LB Devon Kennard (hamstring), and P Steve Weatherford (ankle). 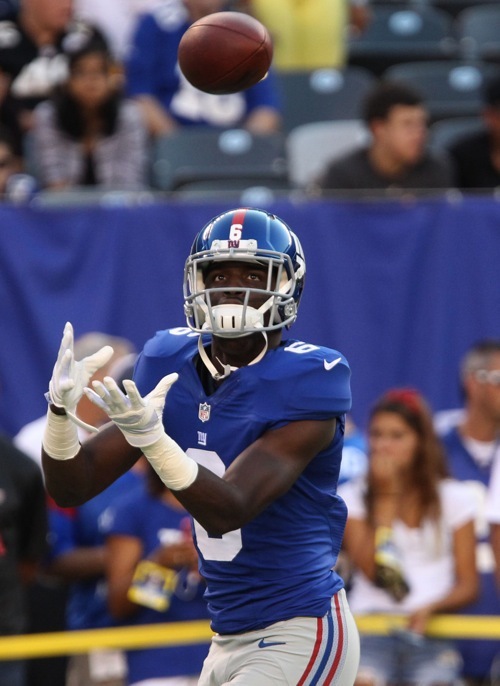 Head Coach Tom Coughlin did not completely rule out Beason practicing this week. “I wouldn’t put anything past this guy, but he’s not going to practice today,” said Coughlin. OT Charles Brown (shoulder) and OT James Brewer (back) practiced on a limited basis. DT Markus Kuhn (ankle) fully practiced. September 17, 2014 Tom Coughlin Press Conference: The transcript and video from Wednesday’s press conference with Head Coach Tom Coughlin are available at Giants.com. Giants Sign LB James Davidson to the Practice Squad: The Giants have signed linebacker James Davidson to the Practice Squad. Davidson was originally signed by the Cincinnati Bengals as a rookie free agent after the 2014 NFL Draft. He was waived on August 26. Davidson was an undersized collegiate defensive end who projects to linebacker at the pro level. Whether he has the overall athleticism and instincts for the position remains to be seen. Obviously, he is a project. Because of this move, we have updated the Transactions and Roster sections of the website. August 26, 2014 New York Giants Injury Report: Not practicing on Tuesday were WR Odell Beckham, Jr. (hamstring), WR Trindon Holliday (hamstring), OG Geoff Schwartz (toe), OG Brandon Mosley (back), OT James Brewer (back), OT Charles Brown (shoulder), DT Markus Kuhn (ankle), LB Jon Beason (PUP – foot), and CB Prince Amukamara (groin). 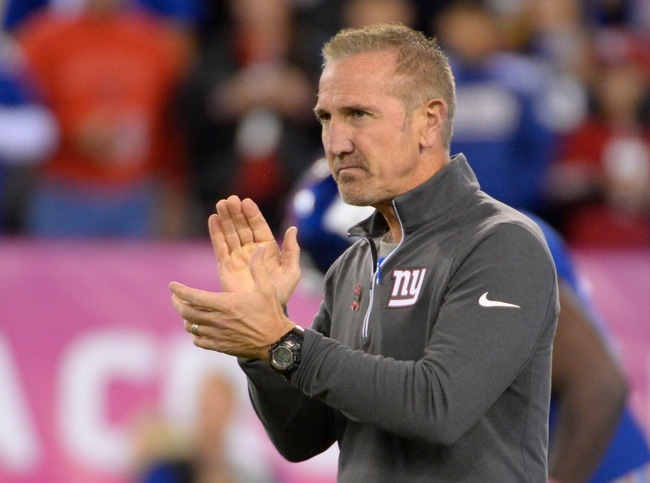 The Giants received relatively good news on Schwartz, who was being examined by Dr. Robert Anderson on Monday. Schwartz will not need surgery to repair his dislocated right big toe. Schwartz will be in a boot for 7-10 days before beginning a rehabilitation program. After that, he availability will be determined on a week-to-week basis. Brandon McManus Traded to Denver Broncos: The Giants announced Tuesday morning that they had waived PK Brandon McManus, along with making 14 other roster moves. However, before that paperwork was finalized, the Denver Broncos made the Giants an offer and traded for McManus. Though not officially announced, the pick is believed to be a conditional 7th round selection in the 2015 NFL Draft. August 26, 2014 Tom Coughlin Press Conference: The transcript and video from Tuesday’s press conference with Head Coach Tom Coughlin are available at Giants.com. August 24, 2014 New York Giants Injury Report: Not practicing on Sunday were WR Odell Beckham, Jr. (hamstring), WR Marcus Harris (shoulder), TE Xavier Grimble (hamstring), OG Geoff Schwartz (toe), OG Brandon Mosley (back), OT James Brewer (back), OT Charles Brown (shoulder), DT Markus Kuhn (ankle), LB Jon Beason (PUP – foot), CB Prince Amukamara (groin), and S Cooper Taylor (foot). WR Trindon Holliday (hamstring) participated in individual drills. RB Peyton Hillis (ankle/foot) and CB Jayron Hosley (foot) returned to practice. CB Zack Bowman (triceps), who was injured in the Jets game, practiced. August 24, 2014 Tom Coughlin Press Conference: The transcript and video from Sunday’s press conference with Head Coach Tom Coughlin are available at BigBlueInteractive.com and Giants.com. Sights and Sounds from Giants-Jets Preseason Game: A sights and sounds video from the Giants-Jets preseason game is available at Giants.com.